The Houston Texans were going through the anticipated difficulties of being a second-year expansion team as they hosted the Carolina Panthers on November 2, 2003, although there were signs of improvement. Coached by Dom Capers, they had a star in the making in first-round draft choice WR Andre Johnson and also received an unexpected boost to the ground game in the form of fourth-round RB Domanick Davis, who had been expected to be a kick returner but was outperforming veteran RB Stacey Mack. Still, the team had lost three straight contests and was at 2-5. Furthermore, they were without the services of starting QB David Carr for the first time in the franchise’s brief history. The 2002 first overall draft pick was out due to a sprained right ankle and 30-year-old backup Tony Banks (pictured above) would be taking his place. Carolina, coached by John Fox for the second year, was cruising at 6-1. The conservative offense was guided by QB Jake Delhomme and benefited from the presence of RB Stephen Davis, acquired after seven years in Washington. WR Steve Smith was a rising talent and dependable WR Muhsin Muhammad started across from him. The team’s defense was the key to the team’s success, however, in particular the solid line. There were over 70,000 fans present at Reliant Stadium and they saw the Panthers get the opening kickoff and drive 83 yards in 12 plays. Eight of them were runs by Stephen Davis, who picked up 20 yards, a fourth-and-one was successfully converted, and Jake Delhomme completed all three of his passes, the last one to Steve Smith for a 24-yard touchdown. John Kasay added the extra point. The Texans had to punt following their first possession and Carolina moved the ball all the way from its 12 to the Houston 25. 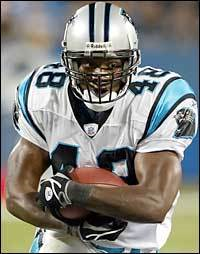 While the Panthers again relied on Stephen Davis carrying the ball for the most part, Delhomme threw to TE Kris Mangum for 34 yards. However, on the first play of the second quarter, a Delhomme pass was intercepted by CB Aaron Glenn to snuff out the threat. Another Houston punt was followed by a nine-play drive by the Panthers that featured Stephen Davis compiling 41 yards on the ground, but the series stalled at the Houston 44 to force a punt. The teams continued to trade punts until the end of the half, with the visitors holding onto the 7-0 lead. It was Houston’s turn to put together a long scoring series to start the third quarter. Domanick Davis ran the ball effectively, with carries of 23 and 17 yards along the way, and Tony Banks completed three passes. The third, to TE Billy Miller, picked up 11 yards on a third-and-nine play and set up a one-yard touchdown carry by Stacey Mack. Kris Brown’s successful PAT tied the score. Carolina once again moved the ball effectively on a long possession of 14 plays that covered 68 yards. Stephen Davis carried six times and Delhomme had completions of 12 yards to Smith and 20 yards to Muhsin Muhammad. Another throw to TE Jermaine Wiggins in a third-and-four situation at the Houston eight gained six yards, but the Panthers couldn’t punch the ball into the end zone and settled for a 23-yard Kasay field goal. The third quarter ended with Carolina back in front by 10-7. Houston started off the final period by driving 67 yards in nine plays. Banks had two big completions to Andre Johnson, with the second gaining 35 yards to the Carolina 28 in a third-and-18 situation. Banks finished the series off by threading a pass through coverage to Miller, who made a one-handed grab for a 20-yard touchdown. With Brown’s extra point, the Texans were in front by four. It was all the home team needed. The Panthers reached the Houston 46 on the next series and had to punt, set back by a personal foul penalty on Smith after he kicked DE Jerry Deloach, and the Texans were able to effectively run out the clock. Banks had key third down passes to WR Jabar Gaffney for 12 yards and 21 yards to Miller. Carolina got the ball back with just one second remaining and Houston held on for the 14-10 win. In a game that featured plenty of long, ground-based possessions by the offenses (each team had the ball seven times), Carolina had more total yards (367 to 267) and also led in first downs (21 to 14). There was only one turnover – by the Panthers – and Carolina was penalized seven times, to four flags thrown on the Texans. The Panthers also recorded the only two sacks of the game, both by DE Mike Rucker. Tony Banks had an efficient performance, completing 13 of 19 passes for 154 yards and a touchdown with no interceptions. Domanick Davis, who was lost to a chest injury in the second half, rushed for 74 yards on 12 carries. Andre Johnson had four catches for 64 yards and Billy Miller also had four receptions, for 58 yards and a TD. For the Panthers, Stephen Davis (pictured at left) ran the ball 30 times for 153 yards. Jake Delhomme was successful on 13 of 23 throws for 193 yards and a TD with one interception. Steve Smith caught 5 passes for 88 yards and a score, although he also had the costly penalty in the fourth quarter. David Carr was back behind center for the Texans the next week in a loss to Cincinnati, but further injuries had Banks in action again as well as third-string QB Dave Ragone. Houston ended up at 5-11 and last in the AFC South. The Panthers topped the NFC South with an 11-5 record and won the NFC Championship, but lost a closely-fought Super Bowl to the New England Patriots. Tony Banks had been a disappointment when starting for the Rams, moving on to the Ravens and Redskins, before becoming the backup for the new Texans in 2002. He saw no action that first year as Carr took every snap. Appearing in seven games in ’03, and starting three of them, he completed 61 of 102 passes (59.8 %) for 693 yards and five touchdowns with three interceptions. 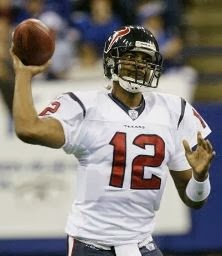 He was the backup quarterback in Houston for two more seasons but never again saw as much action. Domanick Davis (who would later change his last name to Williams) continued to have a productive rookie year, ending up with 1031 rushing yards on 231 carries (4.3 avg.) and another 351 yards on 47 pass receptions. Andre Johnson also had an outstanding first season, catching 66 passes for 976 yards (14.8 avg.) and four touchdowns. Stephen Davis rushed for a career-high 1444 yards on 318 attempts (4.5 avg.) and scoring eight TDs. It was his fourth (and last) thousand-yard rushing season and resulted in his being selected to the Pro Bowl for the third time.